Call A to Z Entertainment, Inc. today for free information about how to hire or book gospel music singer Lisa Page Brooks. We are your agent and talent agency for booking and hiring Christian and gospel music singer Lisa Page Brooks! We book or help you hire any live professional entertainers you want, in addition to those you see on our site. We also help you plan and produce you show or event, so call us today at 888-655-4575 and we’ll be glad to help you. 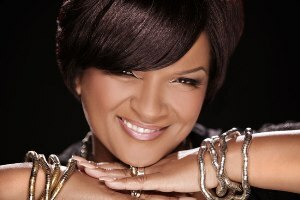 Lisa Brooks has been described as one of the most recognizable voices in gospel music. After encountering her unique vocal presentation, individuals very often verbalize their appreciation with single word descriptions like: amazing, awesome, sincere, and heartfelt. Lisa Page Brooks began her musical journey as the lead singer in the award winning female group “Witness”, Recording 11 chart topping projects over a span of twenty-plus years. Brooks has ministered throughout the length and breadth of this country and Europe. She has released 3 solo albums in addition to her projects with Witness. Her most recent CD, entitled, “Strong” featured a billboard chart # 1 single, “I Want to Say Thank You”. This particular single stayed in the top 5 on the 2010 Billboard Gospel Chart for an amazing 48 weeks! Lisa Brooks continues to impact audiences wherever she ministers, with her unique style and commanding stage presentation. She has been the recipient of the Stellar Award, Gospel Music Excellence Award, and has been nominated for the Dove, Grammy, and Soul Train Music awards respectively. This veteran of the gospel music airwaves returns with a brand new offering sure to induce many more single word descriptions. After the success of her last project, Lisa Brooks is poised once again to impact radio and retail alike with an amazing collection of brand new songs entitled “Ready”. There is much excitement and expectation surrounding this new CD. It is sure to delight listeners with compositions like “More” a declaration for an increased life. “Be ready” a jazz masterpiece, “Heal the land” a cry for renewal, “God thing” – a charge to listen for heaven’s direction, and “Love somebody else” a powerful ballad both musically and lyrically, ministered as only Lisa Brooks can. The project is packed with exhilarating music styling’s that will uplift, inspire, empower, and propel each listener into greatness. It’s all new from the woman often imitated but never duplicated, Lisa Page Brooks – on the Shophar Music, label in cooperation with Habakkuk Records. ” Get ready, “Ready” is coming soon! We can help you book or hire any top Gospel or Christian music singers. We’re your best talent agency and agent for hiring and booking gospel music singer Lisa Page Brooks. So call 888-655-4575 today and we’ll be happy to help you. A to Z Entertainment, Inc. is not the exclusive agency for any live entertainers on this site.